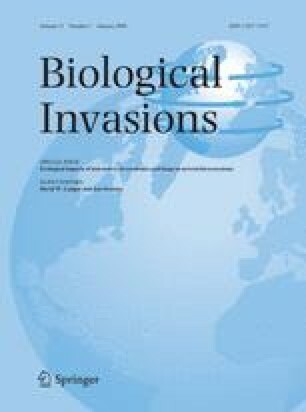 Since the arrival of Europeans about 500 years ago, an estimated 50,000 non-native species have been introduced to North America (including Hawaii) (Pimentel et al. 2000). This averages two species every week; however, the rate of entry is generally thought to have been much higher in the last century as the amount of international trade rapidly increased. Non-native or exotic species figure prominently in our lives. Many of the species that we consume are not native. In urban environments we are inundated by exotic species, especially plants; however, a large proportion of exotic invertebrates are also anthropogenic (Langor, unpublished data). In forestry and agriculture many serious insect and fungal pests are non-native. Rivers, lakes and ponds are increasingly becoming breeding grounds for a wide variety of aquatic invaders. Marine environments, especially inland waters, have been colonized by a large number of exotic species.